Saturday night the New England Black Wolves (5-4) defeated the Vancouver Stealth (1-10) in front of 3,073 fans 12-11 in overtime. Vancouver had the lead for 57:44 before New England tied the game, and then won in the extra session just 45 seconds in. From the opening whistle the Stealth took control of the game. Corey Small opened the scoring for the Stealth and with some great defense and goaltending the Stealth opened up a four-goal lead before New England scored at 5:41 of the second quarter when Stephan Leblanc scored his first of four on the night. Rhys Duch scored just under a minute later and the Black Wolves netted the last two of the half to trail 5-3. The second half was more equal on both sides of the ball as neither team could get on a run. Both teams combined for nine goals in the third with New England getting the upper hand and cutting the lead to a single goal. Leblanc scored his hat-trick in the third, while newly acquired Johnny Powless, a former member of the Stealth, picked up his second goal. Teams exchanged goals in the fourth and Vancouver held an 11-9 lead with 5:33 to go in regulation. Seth Oakes and Kevin Crowley scored 32 seconds apart to tie the game with just over two minutes to go. Both teams had some good looks but the goaltenders came up big as we headed to overtime. New England won the opening face-off of the extra session but couldn’t get a shot away before Leblanc was stripped of the ball by Peter McFetridge. McFetridge’s shot was contained by Evans and Crowley who hired back on D, and Evans recovered the ball and ran it up the floor where he passed to Leblanc, who came off a screen and fired it past Penny for the game winner. Penny clearly played his best game of the season stopping 48 of 60 shots faced. Since taking over the starting job, Penny has played fantastic and has given the Stealth a higher percentage chance of winning their games. 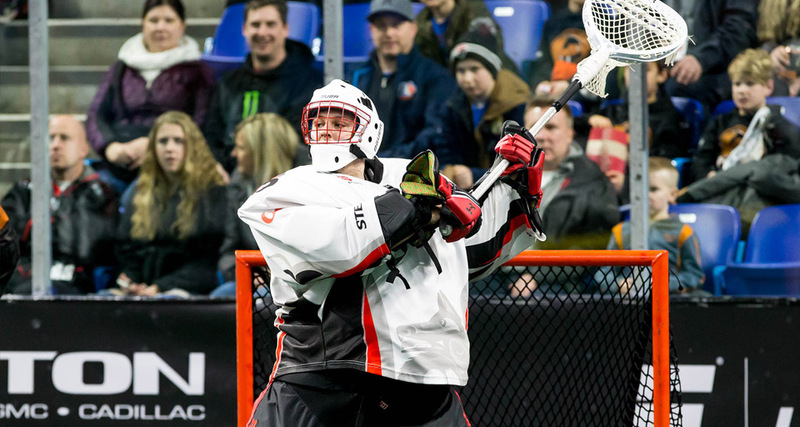 Brendan Fowler was back for the Stealth after only playing six games last season. Fowler won 15 of 27 face-offs in his 2018 season debut. Andrew Suitor and Corey Small netted two goals apiece, while Rhys Duch and Joel McCready (2G/2A each) led the Stealth offense. Logan Schuss had four assists. LeBlanc (4G/1A) and Johnny Powless (2G/1A) led the Black Wolves. Colton Watkinson scored twice. Shawn Evans was held without a goal but added three assists, two of which came on the tying goal by Kevin Crowley and game winning goal by Stephan LeBlanc. Aaron Bold stopped 50 of 61 shots for the victory. New England is now tied with Toronto for second place in the east, only a half game behind Buffalo (6-4). They also hold a one game lead over Georgia (4-5) and Rochester (5-6) for the final spot in the division. The Stealth they are now 1-10 and sit 3.5 games out of the final playoff spot behind Calgary (4-6). With only seven games remaining it looks like Vancouver will be playing out the string, but this is the NLL, and nothing is never definite. Vancouver is back in action on March 3rd at 8:30 p.m. as they travel to Saskatchewan to face the Rush in the Twitter Game of the Week. New England is off this week as they prepare to play Toronto twice in five days. The first of these two meetings with be Sunday March 11th at 3 p.m. in Toronto. The second game will be Friday March 16th at 7:30 p.m. in Uncasville. The Rock won the first meeting of the season 21-9 back on January 27th in Toronto. A win by the Rock in either of their final two matchups will give them the tie breaker over New England should they finish with identical records.